You may wish to bookmark the Information for Academic Advisors page. It not only will provide you with the login link but will also show any announcements specifically for advisors. Enter the student’s 9-digit UIN with no spaces and no hyphens. If you do not know the UIN, enter the student’s full name, if possible. The field is not case-sensitive. If the name is not unique, a table of “Search Results” will appear. The arrow in each column title allows you to sort the results (e.g., by first name, by date of birth) in ascending or descending order, ). Click on the UIN of the student whose records you wish to see. - Use the percent sign (%) as a wild card. - The UIN must contain at least three numbers before you add the wild card. - If you are not entering the UIN, you must enter at least two characters of the student’s last name before you add the wild card. - If you enter only the last name, the search might take a while depending on how common the last name is. Try to enter some other information too, such as the student’s College or the initial of the first name followed by the wild card. - Searching by College must be combined with last name. Clicking “Reset” will erase what you have typed so that you can start over. NOTE: The best way to print Student Profiles is to set the print orientation to landscape. This prevents high school units and other large tables from getting cut off. Please print-preview before printing. You may need to reduce the size from 100% to 90% to make it fit. 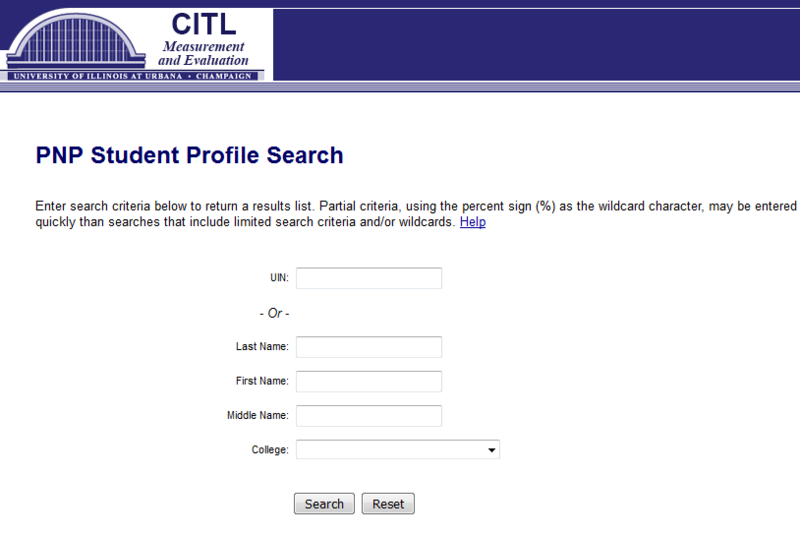 This section provides you with demographic information for the student you selected. Notice the "Last Updated" date is in YYYY-MM-DD format. The Student Profiles are updated every time a test score is processed, so if you print out the profiles, we recommend you always check the “Last Updated” date and keep only the most recent one. The UIUC Placement Results table presents both the test scores and the placement messages for Rhetoric, Chemistry, MCB, Physics (if the student took one or more of these online science placement tests), and Language Other Than English (if the student took an online French, German, Latin, or Spanish Placement Test). The ACT English and SAT EBRW scores that you see will be the highest of a student’s multiple attempts at each test. If the student took both the ACT and the SAT, this table will reflect results from both exams. An "N/A" in the “Credit hours earned” column and the “Courses credited” column means “not applicable.” This will occur for math, chemistry, MCB, physics, and LOTE because students receive only placement recommendations in these subjects; it is not possible for a student to earn proficiency credit from the unproctored, online placement exams. The ALEKS PPL Placement Results table provides information about the student’s placement into a math course based on their highest valid math placement exam score. The ALEKS PPL math exam is required of all new freshmen, and students must register for and complete the course they place into within four months of earning the score; otherwise, the score becomes invalid and the student will have to re-take the math placement exam. - If the student has a valid test score, the test score and the math course placement will appear. - If the student's ALEKS PPL math scores are no longer valid, it will say "Expired ALEKS PPL" and show you the score(s) and the placement(s) that the student originally earned. Scroll down if you wish to see the exact dates and results of the student's prior attempts. The next section pertains to non-native speakers of English who are required to take the English Placement Test (EPT) for their Composition I course placement recommendation. Whether a student must take the EPT is based on the student's TOEFL or IELTS scores that are submitted with their application materials. Either the phrase "EPT (both Oral and Written) Required" or the phrase "EPT (both Oral and Written) Not Required"will appear, along with any test results. If a student submitted Advanced Placement Program (AP) test scores, a summary of the tests taken, scores earned, credit earned, and course placements will appear. If there are no AP scores on file, the message will read “No information found.” AP scores are received electronically from the College Board every week and processed immediately. Results from the May exams usually arrive in early July. If a student submitted International Baccalaureate Diploma Programme (IB) test scores, a summary of the tests taken, scores earned, credit earned, and course placements will appear. If there are no IB scores on file, the message will read “No information found.” Results from the May exams usually arrive in early August. Results from the November exams usually arrive in January. Details: If the student took any of the following tests more than once, results will be presented in reverse chronological order. That is, the most recent set of test scores will appear as the left-most column, while the oldest set of scores is in the right-most column. The date when the student took the exam is in the header of the column. The school that the student graduated from, the date when they graduated, and the number of years that the student studied a language other than English will be the same information that is available in Banner. Note that the Colleges of LAS and Business require that their students complete the fourth level of a LOTE (e.g., 4 high school units). All other Colleges require that their students complete the third level of a LOTE (e.g., 3 units). Students who have submitted to the Office of Undergraduate Admissions the appropriate documentation showing that they successfully completed at least one full academic year in a middle school or high school where a language other than English was the language of instruction will be marked as "4 HSU" for that language. It is always best to quit your browser when leaving any secure site. This is the only way to ensure that no one else will be able to view your students’ confidential information. If you have questions or problems contact us via email at pnp@illinois.edu or call Diana at (217) 265-6248.